Purchase personal injury journals for your firm from Stealth Journals (digital download option); large spiral-bound version; and Amazon. My name is Jamie Davis Whitmer, and I created the Personal Injury Journal out of necessity to help the personal injury law firms and their clients that I work with in connection with my role as a personal injury litigation paralegal. The Personal Injury Journal is a tool to help present each client’s unique damages in a personal way. This is a tool that I believe works best for personal injury clients who fit the treatment pattern of injury; ER treatment; chiropractic treatment; orthopedic treatment; and then possibly a surgery with recovery time. Personal Injury Journal now available on Amazon. Over the years, I have drafted thousands of demand letters and responses to discovery requests, which translates to thousands of conversations with injured plaintiffs. Besides all being injured, do you know what the clients I have helped serve all have in common? The vast majority of them cannot explain to me in a specific way how their lives have been negatively affected by their injuries. Most of them won’t be able to confirm a list of their treating facilities either. I hear a lot of comments along the lines of: “this has been going on two years, it’s very hard for me to remember everything.” Why not give your clients a Personal Injury Journal to use as a tool upon signing as part of your welcome packet that will help them, and help your paralegal work their case? 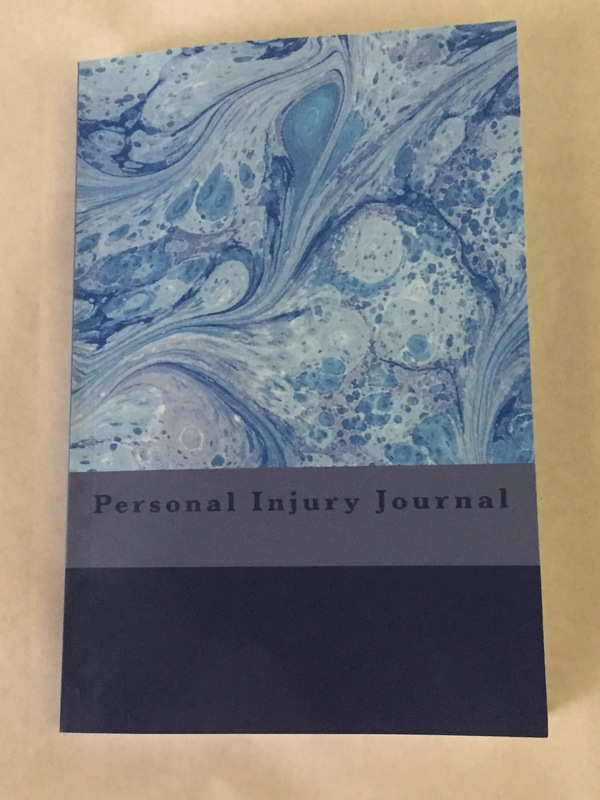 The Personal Injury Journal is also available in a digital download via stealthjournals.com for those of you who wish to print on demand and assemble your own spiral-bound notebooks that can be customized with your specific firm logo and easily scanned later. Besides the pain and suffering aspect, another way I see value in the personal injury journals is that you are giving the client a tool to keep track of all their doctors and note when they finish treatment. You may not realize it as a lawyer, but for the paralegal, sometimes it can be very challenging to get the client to tell you exactly where they treated, and/or when they finished treatment! I really could not tell you how many times I have had a client tell me: “I just had an MRI.” Me: “Okay, what facility did you visit? We need to make sure we order the bills and records.” Client: “I’m not sure. It was in Atlanta.” Great. Go ask your paralegal how effective this is when you’re trying to efficiently help people. It doesn’t have to be this hard. It is inevitable. In writing a demand, or in answering discovery, when I ask a client: “How have your daily activities suffered or changed because of this accident? Is there anything that you can’t do at all now that you were able to do prior to this accident?” Crickets chirp in the background, while I wait for them to fill the uncomfortable silence. Finally, the injured client will say something along the lines of: “What do you mean? I was hurt. Everything changed. I didn’t know I was going to have to answer this! Let me get back to you.” Few can tell me anything more than a blanket statement that feels impersonal, or even worse, disingenuous because of the lack of specific details. If that is my impression, what must the insurance adjusters be thinking? It seems to me that one of the biggest obstacles in negotiating a higher settlement is making the other party see your client as more than just a set of medical records that they mechanically feed into Colossus for review with some arbitrary number that their system spits out and tells them to offer! At the time I was inspired to create the Personal Injury Journal, I was reading Daniel Pink’s “To Sell is Human.” Chapter 9 is entitled “Serve,” and discusses the importance of making work personal and purposeful. A study was quoted about how radiologists began reviewing CT scans more meticulously after the patient’s photo was included. The doctors began seeing the patients as human beings, and became less mechanical and detached, and even had a much higher rate of reporting more incidental findings! If this happened with doctors, surely the same might happen with insurance adjusters. Besides concluding that you should send in a photo of your client with their demand letter, what else might you take from this study? Should you be telling the client’s story in a more personal way from the very beginning so that the opposing side is forced to see injured plaintiffs as human beings instead of just another set of medical records? Enter the Personal Injury Journal. Consider it as an analog version of a “Day in the Life” video. Every client has a unique story to tell. Whether it is a college student missing exams and a part-time job; or a mother missing out on caring for her child, everyone’s loss is different. Why not give your clients a personal injury journal upon signing that will help them present their unique circumstances more clearly? Might the adjusters, opposing counsel, or jurors see them more personally and offer higher settlements prior to trial if you are able to cite specific details of their loss? Do specifics convey a more believable and sympathetic client? It would seem that employing specifics would potentially increase the value of Plaintiffs’ pain and suffering damages in their injury cases. Who wants to go to trial against a person who has an entire book (or multiple books) of specific instances of how the Defendant has negatively affected their life? No way! Policy limits case! Get them out of here, get this settled. Interior sections of the Personal Injury Journal.